Seeking the Lord’s guidance, David asks about going up to Judah. The Lord directs David to go to Hebron. He has two wives right now, Ahinoam and Abigail. All his men came with him and settled. David was anointed king over Judah. David thanked the people of Jabesh Gilead who buried Saul’s body and promised to show them favor because of it. 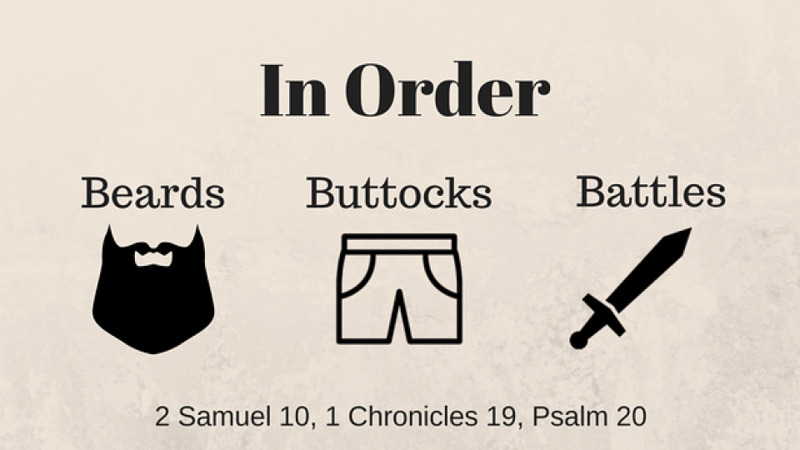 A commander in Saul’s army, Abner, wanted the throne. He convinced Saul’s son, Ish-Bosheth to join him to fight against David. 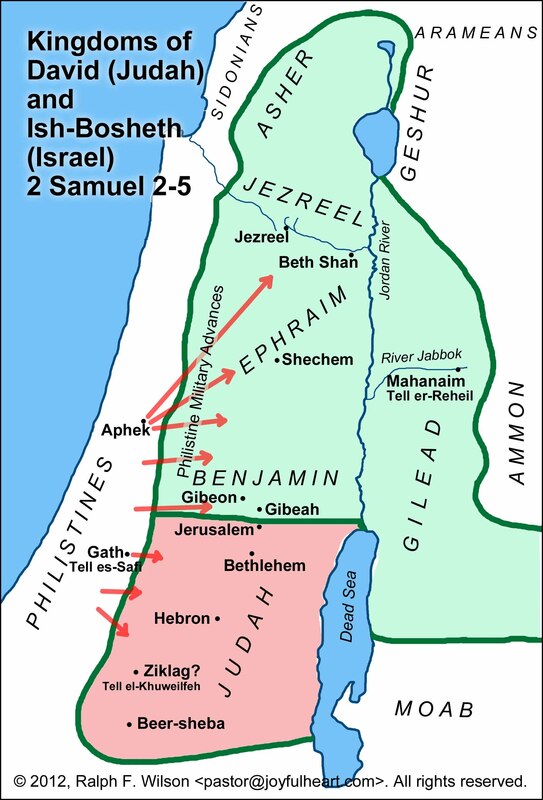 After two years of Ish-Bosheth being king over Israel, a battle was fought at Gibeon. Some men from both sides were sent to fight as representatives. All died and an all-out battle ensued. Abner was defeated by David’s men. They pursued Abner, resulting in the death of Asahel. Abner convinces the men of David (Judah) to give up the pursuit, which they do. Abner continues his flight. 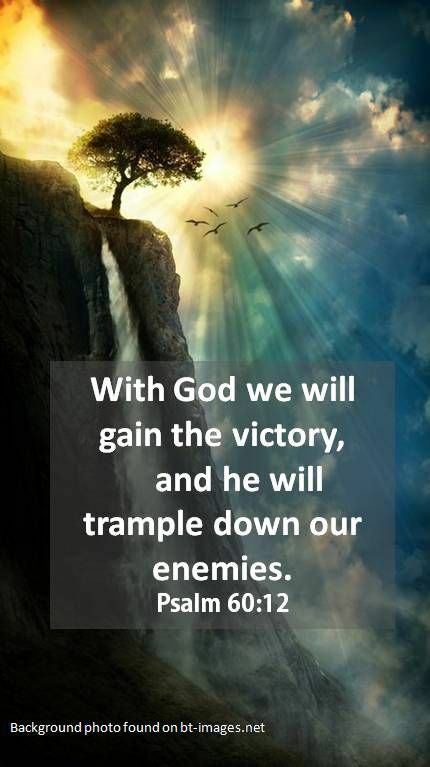 The war between the houses of Saul and David lasted a long time, with David growing stronger and Saul’s growing weaker. During this time, David has 6 sons by 6 different wives while in Hebron: Amnon, Kileab, Absalom, Adonijah, Shephatiah, and Ithream. 6) David had to decide when to claim the throne of Israel. He asked God first. 7) Worse. Abner was the commander of Saul’s army. He mounted what was in essence a coup against David, using Saul’s son a puppet, and causing David’s men to fight against their own countrymen. 8 ) Part personal Question. My answer: It’s a warning to not let others use you. It shows the animosity that happens when you go against God. I can pray first always in what I do and choose wisely those I surround myself with. To me, what stood out was how many wives David has. That’s a lot of in-fighting, favoritism, and jockeying for position of favorite internally. I’m unsure how David even dealt with all of that. I love how we see man’s unchanging nature as Abner wants power and uses whoever he wants to get it. It’s a warning to always be aware of who your friends are. The key to David’s success is life was his constant inquiry of the Lord. With rare exceptions, he did so. David wanted more than God’s blessing on his plans; he wanted to be right in the middle of God’s plan. At this time David was still in Ziklag, in the territory of the Philistines. Out of great discouragement and despair, he had left the land of Israel and lived almost as a Philistine among the Philistines. Now that David was restored to the LORD, he wondered if it was time for him to go back to his homeland. David didn’t want to appear opportunistic, as if he only came back to Israel because Saul was dead. While not being overly concerned with appearances before man, he was not unconcerned with appearances either. God was faithful to answer when David inquired. Since David just came out of a period of spiritual decline, God could have put him on “probation” and refused to speak to him for a while. Instead, the LORD spoke to David and gave him guidance. 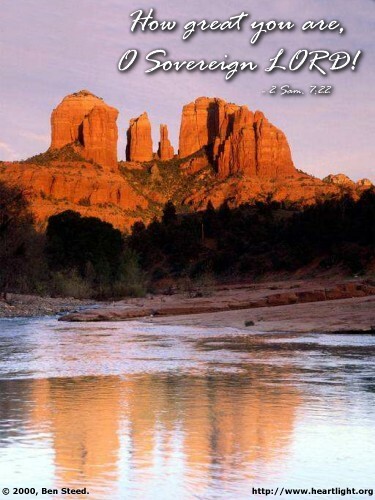 It has been 15 to 20 years since David was anointed king over Israel (1 Samuel 16:12-13). What does David’s anointing show? It’s better to let God lift you up through others than to strive to advance yourself. We should strive to advance God’s Kingdom and leave the advancement of self in His hands. The first anointing wasn’t enough. We need a fresh anointing from God and ongoing experience with the Holy Spirit. 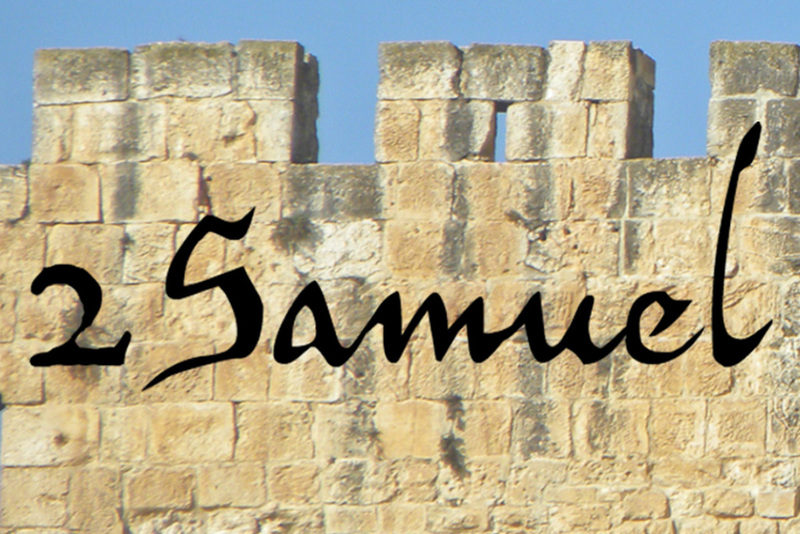 Abner was Saul’s cousin (1 Samuel 14:50) and the commander of Saul’s armies for many years. He first met David when David was a young man (1 Samuel 17:55-57). David once challenged Abner when he had the opportunity to kill Saul but did not. David pointed out that Abner failed to protect his king. Saul had three sons who died with him in battle (1 Samuel 31:6). There is no previous mention of Ishbosheth among the sons of Saul, so it is possible that he was an illegitimate son or the son of a concubine. For two years, David allowed Ishbosheth to reign over most of Israel. These two years showed remarkable patience, longsuffering, and trust in God on David’s part. Ishbosheth was not the LORD’s anointed like Saul – David seemed to have every right to crush this man who stood in the way of his calling. Yet out of trust in the LORD and respect for Saul’s memory, David waited. It seems strange that many of the tribes preferred Ishbosheth to David. 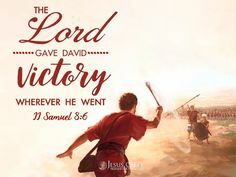 Yet since the Philistines had overrun many of the other tribes of Israel, they were even more hesitant to come out-and-out for David, who was no longer fighting for the Philistines and was probably unliked because of it. 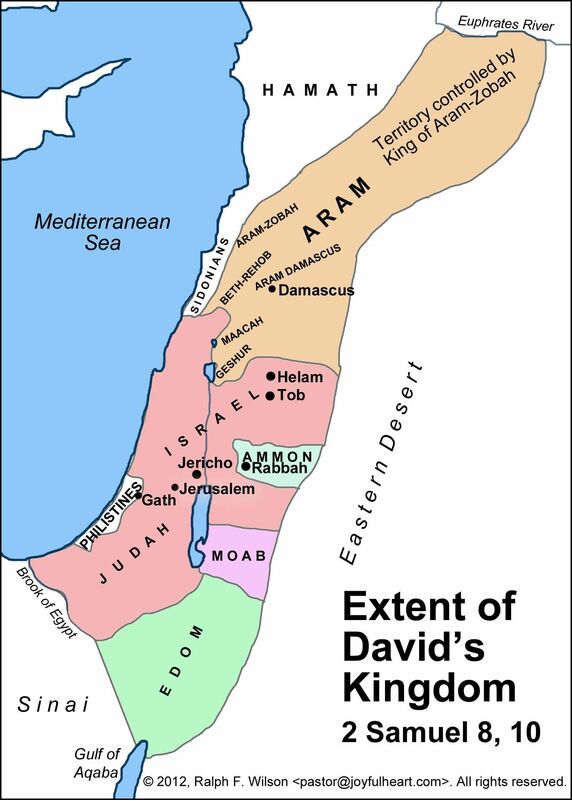 7 years and 6 months David ruled in Hebron, 2 of which, Ishbosheth ruled Israel. Joab was apparently one of the 400 men who joined David at Adullam Cave (1 Samuel 22:1-2), or he joined with David during this general period. Joab had two notable brothers: Abishai and Asahel. 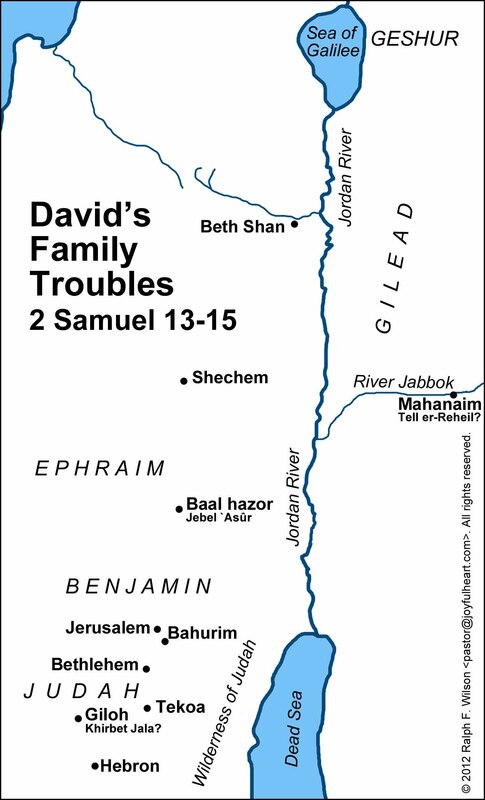 Joab, Abishai, and Asahel were David’s nephews, the sons of David’s sister Zeruiah (1 Chronicles 2:16). Joab had a long and checkered career as David’s chief general. Abner and Joab were each tough, mean, military men who were completely devoted to their cause. Abner suggested some kind of contest or duel between a select group of his men and Joab’s men. When the two groups of 12 met, it quickly degenerated into a mutual bloodbath. Yet David’s men under the command of Joab prevailed in the very fierce battle that followed this bloodbath at the Field of Sharp Swords. Abner first asked Asahel to turn back out of concern for his own safety. This didn’t make much sense to Asahel because it seemed that Abner was at the disadvantage. Abner also appealed to Asahel on the ground of military honor – that officers should not strike down officers, especially when it might lead to ugly retribution and the danger of leaderless armies. Yet, Asahel refused to turn aside, being too single-minded in his determination to kill Abner and crush the armies opposing David. Clearly, Abner killed Asahel in self-defense – it was the only thing he could do. Yet his concern (How then could I face your brother Joab) was entirely justified, and Joab will make it his passion to avenge his brother’s death. Motivated by revenge for their brother, Joab agreed to the cease fire to rest his army and avoid more bloodshed. Abner and the army of Ishbosheth lost 360 men to 20 in the army of David. Joab, having the military advantage, should never have accepted Abner’s appeal for a cease-fire at the battle of The Field of Sharp Swords. The fact was that they couldn’t just get along, and that there could be no peace between the rightful king David and the pretender to the throne, Ishbosheth. The cease fire led to a long war. When we try to make peace between King Jesus and King Self within us, the result is a long, bitter war. It is so much better to simply surrender and submit to the reign of Jesus. The increasing strength of David and increasing weakness of Saul’s house did not begin when Saul died. 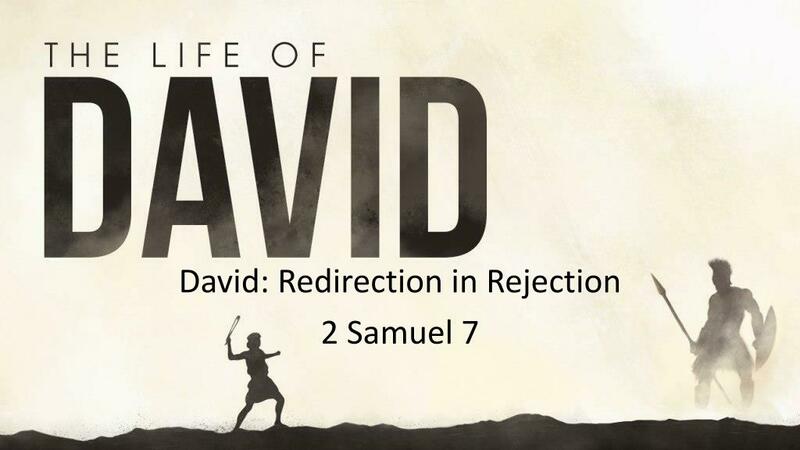 It began when God first chose David and withdrew His Spirit from Saul (1 Samuel 16:13-14). David was in Hebron for 7 years. While there he had 6 sons by 6 different wives. This was against God’s command to kings (Deuteronomy 17:17) and against God’s heart for marriage (Genesis 2:24, Matthew 19:4-6). Adding many wives was one way great men and especially kings expressed their power and status. David was troubled because of his many wives. Some wonder why the Bible doesn’t expressly condemn David’s polygamy here, but as is often the case, the Scripture simply states the fact and later records how David reaped the penalty for this sort of sin in regard to his family. God used and blessed David despite his many wives. Yet his family life and these sons were obviously not blessed. 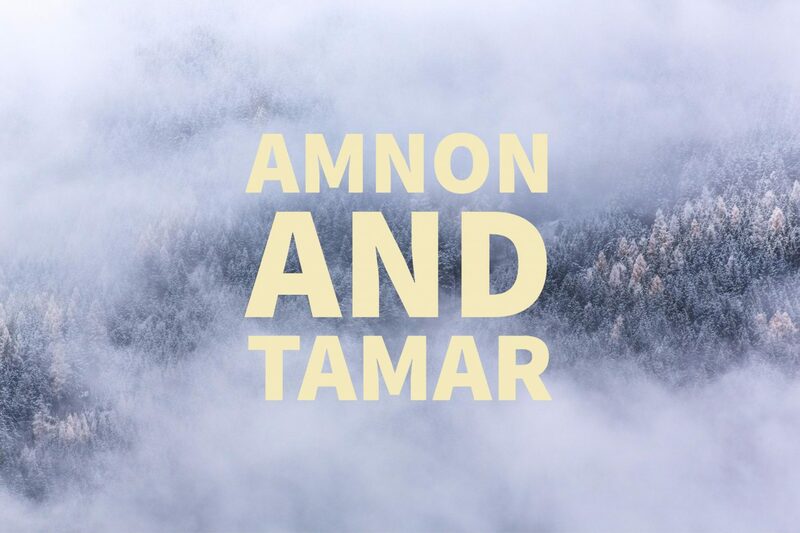 Amnon raped his half-sister and was murdered by his half-brother. Kileab is also known as Daniel in 1 Chronicles 3:1. The few mentions of this son indicate that perhaps he died young or that he was an ungodly, unworthy man. Absalom murdered his half-brother and led a civil war against his father David, attempting to murder David. Adonijah tried to seize the throne from David and David’s appointed successor – then he tried to take one of David’s concubines and was executed for his arrogance. Shephatiah and Ithream either died young or were ungodly and unworthy men because they are mentioned only once again in the Scriptures – in a generic listing of David’s sons (1 Chronicles 3:1-4).